An important fix has been added to CU3 and is about backup and restore, and issue that prevents a successful backup from restoring. More information on this particular fix can be found in Microsoft knowledgebase article KB2888315. A complete list of fixed issues and new features can be found in Microsoft knowledgebase Article KB2892464. In contrast with the Update Rollups as we’ve seen in Exchange 2007 and Exchange 2010, which were only a set of hotfixes bundled together, a Cumulative Update is a full version of the product. So, it is now possible to install an Exchange 2013 server from scratch using the CU3 download. Another advantage of a CU is that Microsoft can bundle new functionality into the product, even Schema changes are possible (as a matter of fact CU3 does include a number of Schema changes) but also the Configuration container in Active Directory can be changed. The downside is that installing a CU is basically a full upgrade, just like a Service Pack in Exchange Server 2010. When you have made customizations these will be lost. OWA customizations is an example of this, but also changes in config files for example will be overwritten. This can be painful, especially when you don’t have everything well documented. The problem is however that there’s no way back. When the setup crashes and the server ends-up in an unknown (and unmovable) state you’re in deep trouble and you need to start a disaster recovery process. If you’re running a DAG and a DAG member fails than it’s not a big deal since your data is safe on another DAG member. But if you have a single Exchange 2013 server it most likely will be a long night L. Also when you have successfully installed Exchange 2013 CU3 there’s no way back to a previous version of Exchange 2013, there NO WAY of uninstalling CU3 except for uninstalling the entire server. Note. 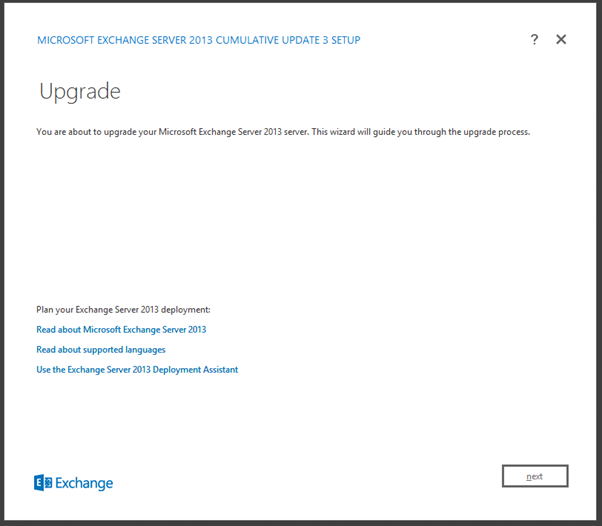 The next Cumulative Update for Exchange 2013 will be CU4, but at the same time this will be Exchange 2013 Service Pack 1. Or you can leave the upgrade to the normal setup procedure of course. Important Note: To prevent installation issues you should ensure that the Windows PowerShell Script Execution Policy is set to “Unrestricted” on the server being upgraded or installed! You’ll see the 4th line saying “Remove Exchange Files”. 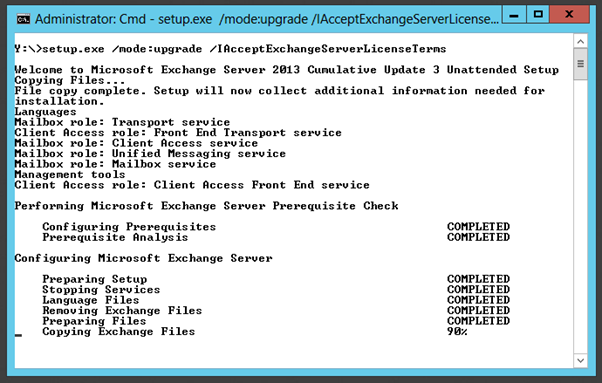 CU3 is a full package and will actually uninstall Exchange 2013 and reinstall Exchange 2013 CU3. Most of the settings will be kept (at least the ones that are stored in Active Directory) but any customization is lost when upgrading to CU3. Important to remember! It is also possible to use the normal (graphical) setup application. Just navigate to the CU3 binaries and start the setup.exe application and follow the wizard. Redistribute the Mailbox databases using the RedistributeActiveDatabases.ps1 -DagName <<name>> -BalanceDbsByActivationPreference -Confirm:$False command. Both scripts can be found in the $Exscripts directory (C:\Program Files\Microsoft\Exchange Server\V15\Scripts). Use the Get-MailboxDatabase | Get-MailboxDatabaseCopyStatus command to check the status of the Mailbox database replication. 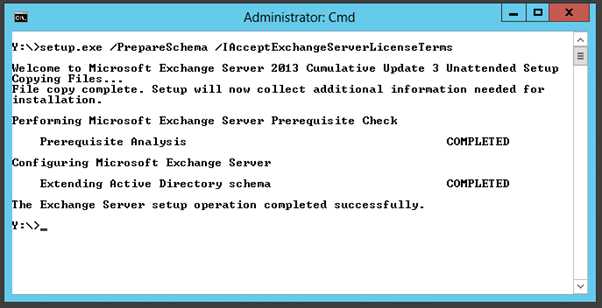 More information on Exchange 2013 CU3 can be found in What’s New in Exchange Server 2013 and the CU3 Release Notes. At the same time Microsoft has released Rollup Update 3 (RU3) for Exchange Server 2010 Service Pack 3. Update Rollup 3 is not considered a security release as it contains no new previously unreleased security bulletins. A complete list of issues resolved in Exchange Server 2010 Service Pack 3 Update Rollup 3 may be found in KB2891587.